Industry-based PhD Programme or Industrial PhD at UTM an attractive alternative to the conventional PhD, being better suited to the needs of the industry, and providing a more vocationally oriented doctorate with industrial relevance. It is highly flexible and able to accommodate candidates from all levels of management. It is a full-time postgraduate programme where candidates have the opportunity to spend most of their time carrying out the research at their respective organisations or industries. Selection of candidates from industry are through discussions between IPPT & Industry. Application is open to all Malaysian citizens who are working in the industry . Applicants must have a Master’s degree or equivalent recognized by the university ; OR The applicant holds a Bachelor and industry experience in the relevant field . ( Subject to the terms of the Recognition of Prior Learning ( RPL ) set by the Agency Malaysian Qualifications Agency ( MQA ) , and the conditions set by IPT ) . Students may apply the Incentive Publication Claim as a endorsements from the university for the research publications that they have produced. Application is subject to the availability of the allocation approve by the University. Applicant must be First Student Author and Supervisor(s) must be one of the authors. Students are registered as PhD/Master by Research. Published paper must have volume no. and page no. Applicants must meet Anaheim University’s MBA entrance requirements. Applicants must maintain standards set forth by the Scholarship Committee and/or the University’s administration in order to remain in good standing and continue to receive the scholarship funding throughout the remainder of their program. Scholarship recipients are expected to maintain a minimum of a B average at all times and complete each course with a minimum of a 3.0 grade. Scholarship recipients must also remain continuously enrolled from the commencement of their program through graduation. Skipped term fees are not included in the scholarship and skipped terms are only allowed with special permission from the University’s Dean. – standard application materials required for an Anaheim University online MBA or Master of Entrepreneurship program. Click here for a list of program entrance requirements. The Hitachi Global Foundation aims to contribute to achieve the Sustainable Development Goals (SDGs) by solving social issues through the promotion of Science and Technology. 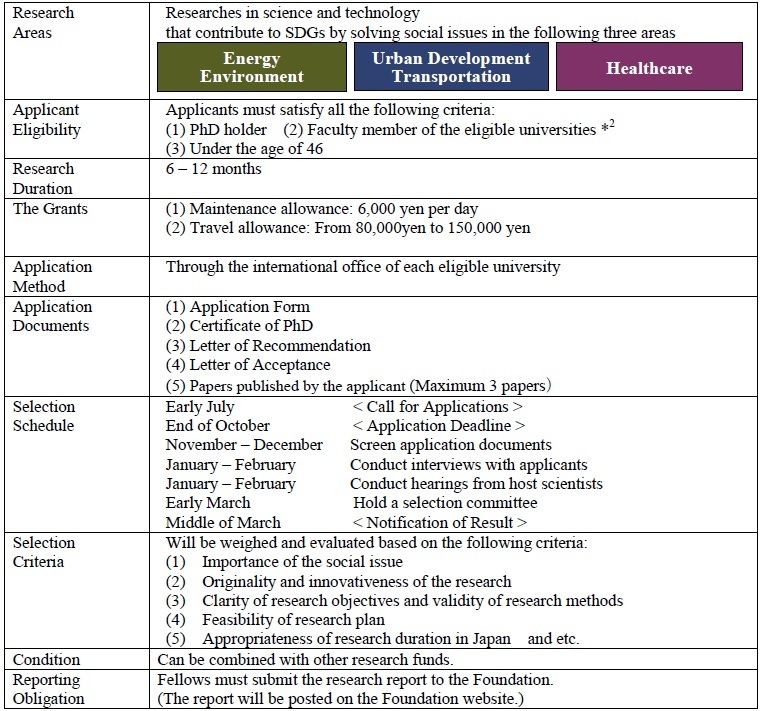 The Foundation carries out the Hitachi Scholarship Research Support Program that offers research support grants to the faculty members who wish to conduct collaborative researches that contribute to solving social issues at universities or research institutions in Japan. Contents of the grants are the followings. Application must be endorsed by the Deputy Vice-Chancellor (Academic & International). Kindly submit the completed application documents to Miss Leilawati Mokhtar, Office of Deputy Vice-Chancellor (Academic & International) at mleilawati@utm.my before October 15, 2018. Should there be any queries, please do not hesitate to contact us (+607 – 553 0453).